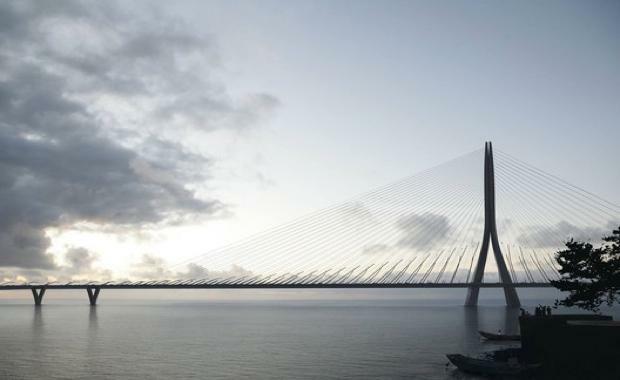 The firm, which collaborated with Leonhardt, Andrä und Partner, has designed the world's "longest single-tower, asymmetric cable-stayed bridge" which will cross the mouth of the Tamsui River, adjacent to Taiwan Strait. The Danjiang Bridge will increase connectivity between neighbourhoods, reduce traffic congestion and complete the northern seashore highway system. Image via Zaha Hadid Architects[/caption]According to a statement released by the firm, the cable-stayed bridge "minimises its visual impact" by using only one concrete structural mast to support the 920m road, rail and pedestrian deck made from steel. Image via Zaha Hadid Architects[/caption]"The mast is designed and engineered to be as slender as possible and positioned to offer the best structural performance, avoid impeding the navigability of the river and also minimise any interference with the views of the sunset from popular viewing points along the river. This single-mast design also minimises structural elements in the riverbed in accordance with the increased protection programs of the estuary's ecosystems," the statement read. Image via Zaha Hadid Architects[/caption]ZHA Director Patrik Schumacher posted on Facebook: "The Danjiang Bridge...is destined to make a conspicuous landmark against the backdrop of Tamsui's famous sunset."